Godfrey's Mama: "She's Mod Assist for Toilet Transfers." I often run across things on the Internet that I think might be of interest to people I know. Two of my closest friends are Occupational Therapists. And when I saw this website of Adrian Rodriquez's "toilygraph" art, I naturally thought of Briana and Eva. Click here to see the art he creates in his commode. It's quite unique. However, I'm sure the OT's I know could share a few stories about the things they have seen in toilet bowls. I'm just not sure it would pass for "art". As I surfed around, I found some other sites that might be interesting to my OT friends. Toilets of the world. 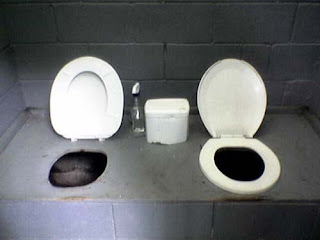 A site devoted to..well, pictures of toilets of the world. Random pictures of toilets. You can find pictures here of toilets around the country. The Bathroom Diaries. Find reviews of bathrooms from around the world. The Japanese Apricot Washer and The Electric Raised Toilet Seat. The OT's in Japan have it easy with these two ingenious inventions. Why all patients would be Modified Independent or Supervised, at the very least. I had better stop now, before this post really goes down the crapper. okay....confession, my mom and dad have the apricot washer in their bathroom. I tried it once, didn't like it so much. Just the pure anticipation of waiting for something to squirt at your vajayjay is unbearable. When it finally does happen, it shocks you to the point that you instinctively leap off the toilet seat, thus defeating the whole purpose. It's just simply WRONG!!! Okay, finally found some time and remembered to take a look at this blog. The only thing I can think of at the moment is, "pass me the emesis basin". I'm feeling just a wee bit queazy.